The most popular tour every season is the East Coast Tour. Guests will enjoy games at the most iconic ballparks in Major League Baseball plus spend a day at the Hall of Fame. You’ll visit Boston, Cooperstown, New York, Philadelphia, and Washington D.C. on this extensive tour. Book soon to guarantee your spot! 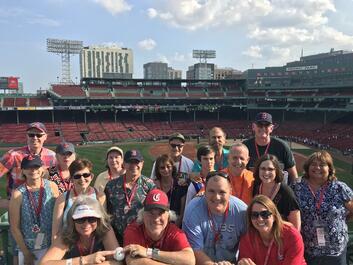 Big League Tours group on the Green Monster at Fenway Park.